Although creating extraordinary constructions in three dimensions, Rutgers–Camden artist Margery Amdur views herself as a painter. The influence of 20 years as an installation artist is evident in the complex works she assembles, combining aspects of installation art, painting and sculpture. A practitioner of yoga and meditation, she works in an intuitive, meticulous, and methodical manner. Amdur’s inspired, mixed-media constructions are currently on display in a solo exhibition through Sept. 8, in The Noyes Museum of Art of Stockton College, located at 733 Lily Lake Road in Galloway. The museum will host a discussion with Amdur on Thursday, July 25, at 6:30 p.m. In the past ten years, the associate professor of art at Rutgers–Camden has experimented with different media and disciplines. Drawn to working with soft materials, she recently began experimenting with cosmetic makeup sponges. She notes that this unusual raw material has a subtle connection to her previous feminist work. Initially working on her studio floor with loose sponges and pastel pigments, she saturated the sponges with color and laid out her compositions. 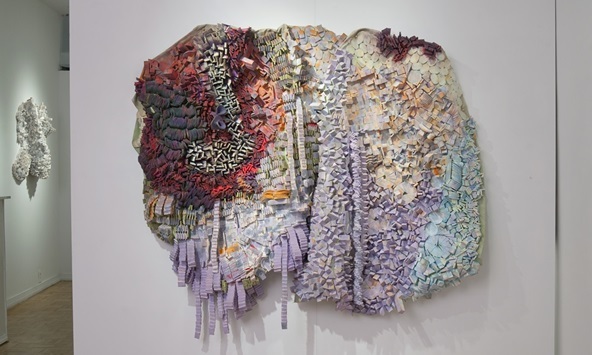 Her latest series, called Amass, is at the intersection of nature and architecture, with connections from topographical maps to hanging gardens, and composed of a mosaic of thousands of small sponges and colors both bold and nuanced. Individually gluing the sponges to a canvas backing, she paints the pieces with ink and gouache, finishing with a rubbed on layer of soft pastel powder, creating vibrant ranges of colors and shapes. In a rigorous, time-consuming process, she bends, folds, and pins the artwork to create hills and valleys, pushing some shapes and colors to the fore while others recede. A resident of Philadelphia, Amdur recently completed Walking on Sunshine, a colorful resin floor installation spanning 4,000 square feet, in a Philadelphia subway station. In addition, she has had more than 50 solo and two-person exhibitions, and has appeared in numerous group shows. Her international exhibitions have been in Turkey, Hungary, and England. 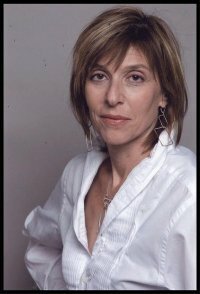 She has curated and organized national exhibitions and is the recipient of more than a dozen awards and grants. Her work has been reviewed in national and international publications, including Sculpture Magazine, New American Paintings, Seams to be Constructed, and New Art Examiner. Originally from Pittsburgh, Amdur received her bachelor in fine arts degree from Carnegie–Mellon University, and her master in fine arts degree from the University of Wisconsin–Madison.